*Thought we’d finish off the year with this Southern delicacy since I just bade my mom and brother goodbye after their Christmas visit to Tahoe. INFO: Mix egg and buttermilk in a shallow dish. 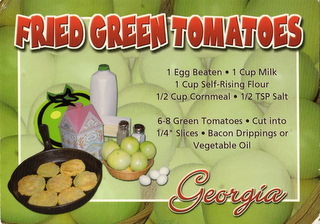 Working in batches, dip tomato slices into the egg mixture, allowing excess to drip back into dish. Coat with flour mixture. Fry in hot oil (375) in a skillet until browned, turning once with tongs. Transfer to a colander to drain. Yields 6 servings.